Why do I bother to pot hardy “Dutch” bulbs in October? Well, because they introduce spring to my home when the outside world is covered in snow. They provide terrific decoration, too. A bowl of blue Muscari (above) makes a stunning centerpiece for a February dinner party. And finally, because bulb-forcing is fun, fun, fun! Hardy bulbs are a little more challenging to grow than tropical types. Tropical bulbs, which include amaryllis and Narcissus paperwhites, need only water, warmth, and light to send up their flowers. The hardy bunch –tulips, hyacinths, and daffodils to name just three — will only bloom after they’ve received a cold, dark rooting period. 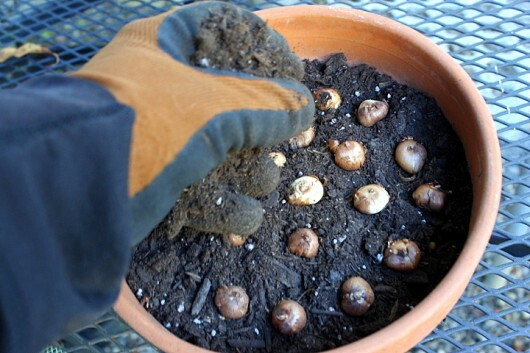 Can you simply chill the bulbs, and then pot them later? Yes, you can. But speaking from experience, chilled-then-potted bulbs end up blooming at about the same time as their outdoor kin. 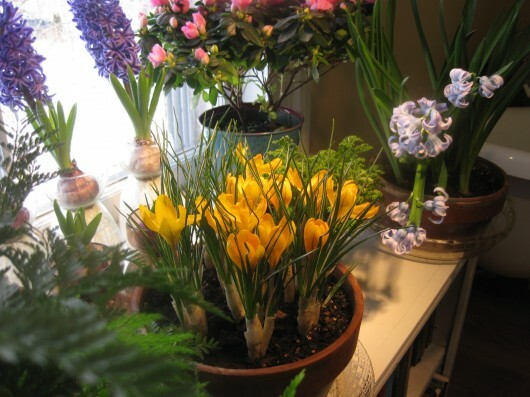 If you want flowers in the depths of winter — I certainly do — then it pays to pot the bulbs right from the get-go. To insure extra-early blooms, pot the bulbs in early-to-mid October. 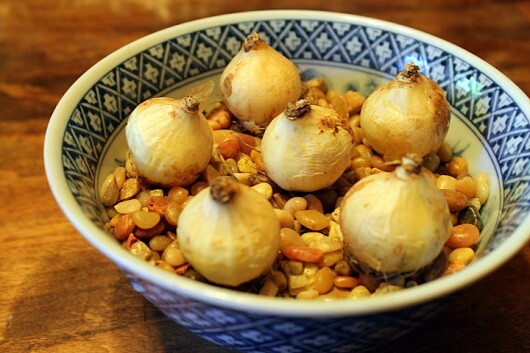 The bulbs will make their roots while in cold-storage, just as they do in nature. When introduced to sunlight and warmth in early January, they will bloom when you want them to — in late January or early February. 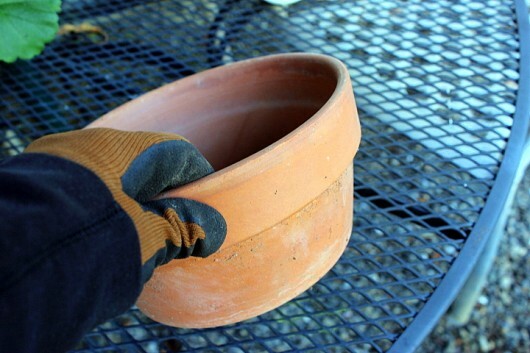 How to pot hardy bulbs. First, select a pot. You can use either plastic or clay containers, providing they are equipped with a drainage hole. Since I can’t bear the sight of plastic in my window garden, I use only clay pots and pans. A “pan” (pictured above) is a shallow pot intended for bulbs. Next, place a piece of broken pottery oven the drainage hole. Or, cover the hole with a coffee filter or a piece of window screen. Add some well-draining potting mix. For large bulbs, such as daffodils, fill the pot only half-way with soil. For small bulbs, such as the crocuses I’m about to plant, fill the pot about three-quarters full. Set the bulbs on the soil, with their pointed tips facing up. If you have flattish bulbs, such as Fritillaria, just look for tell-tale signs of old roots. Plant the rooted end down. Then add just enough potting mix just to barely cover the bulbs. 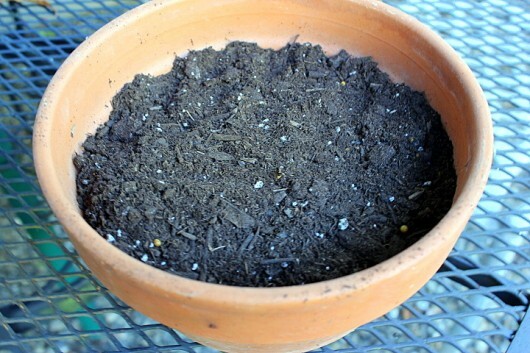 When properly potted, you’ll have a 1-inch basin between pot rim and soil to allow for water. 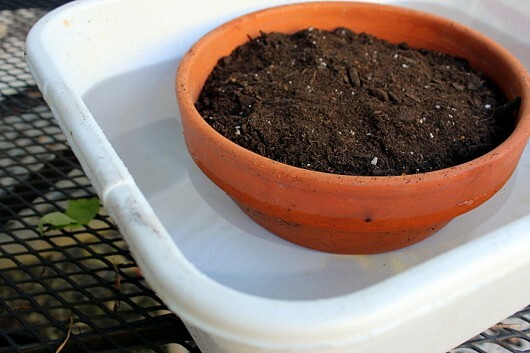 For the initial moistening, I always place the pot right up to its rim in a sink or dishpan of water, and I leave it there until the soil has absorbed all the moisture it can hold. Thereafter, and only when the top inch of the soil feels dry, I apply water from the top. Oh. I should probably mention that certain hardy bulbs can be grown without any soil at all. As I described in a previous post, I like to grow hyacinths in little water-filled vases. 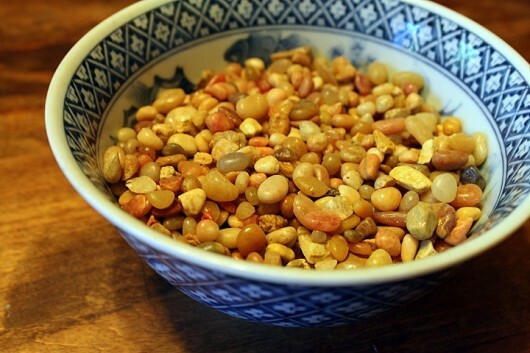 Fill an attractive bowl half-way with pebbles. Polished pebbles, available at aquarium shops, are especially decorative, and you can re-use them year after year. 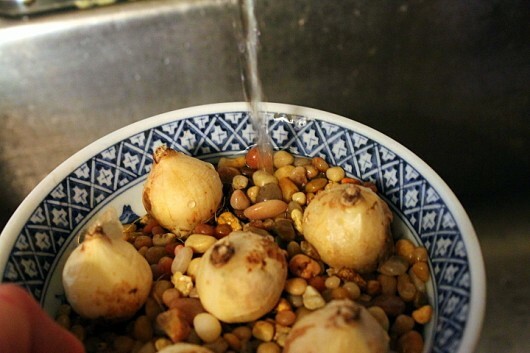 Then add enough water to barely tickle the base of the bulbs. 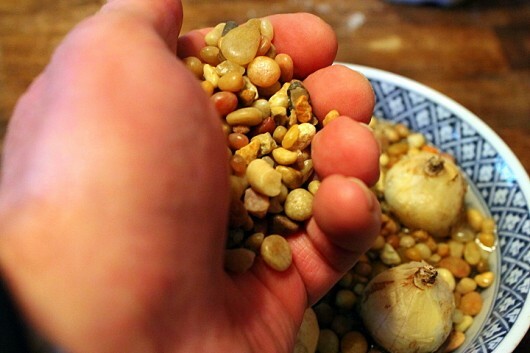 Finally, sprinkle more pebbles around and between the bulbs to hold them in place. Cold storage. Before they can bloom, all hardy bulbs require 10-12 weeks in a dark, cold (35-45°F) location. A spare refrigerator is ideal, but it must not contain ripening fruit. Fruit gives off ethylene gas, which can sterilize the bulbs. No spare refrigerator for you? Then proceed as our great-grandparents did, and place the pots in a dark, cold cellar, garage, or attic. Although I start my bulbs extra-early in a spare refrigerator, I always move them to the dark closet in my unheated mudroom by December. The mudroom is sufficiently cold by then. 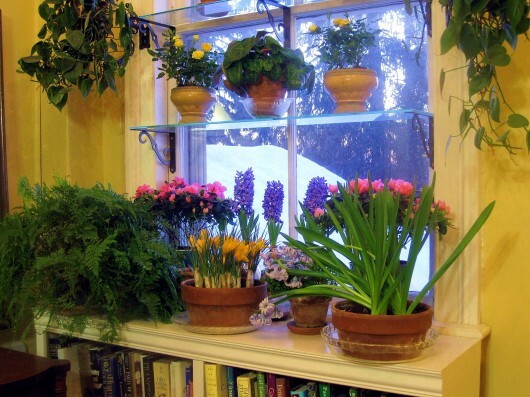 In January, bring your pots (and vases and bowls, if you have them) to a sunny but cool (65°F maximum) window. Three or four weeks later, the bulbs will provide you with your own, private preview of spring! Wanna save your forced bulbs for future planting outdoors? Then be sure to give them the love and care described in this riveting post. 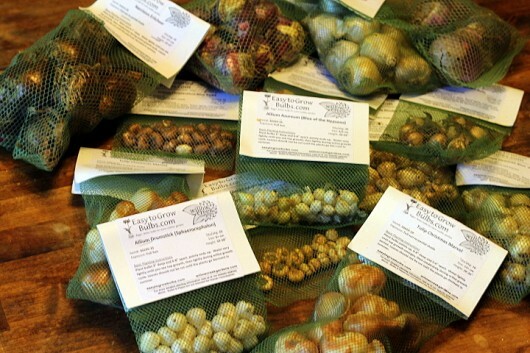 Think you’ll join this hardy bulb-forcing brigade? Then by all means leave a comment below. My tulips, daffodils, and hyacinths would love to hear from you. Wonderful tips! I am a beginner but I am pretty enthusiastic about gardening, so I am very happy to find this post! Hi Natalie – Nice to meet you! Hi Leslie U. – Nice to meet you. So glad you enjoy the cooking and gardening articles on this website. Good luck with your bulb-forcing project! Would love to try this, but need to find a place to let them chill. Options are a basement, but it is hooked into the furnace system so is not exactly unheated, or our carport shed. I am thinking our shed may be best, but there are two windows in it. Do I try and cover the pots with a box? We are in Chattanooga area. . . Thanks for the tip about fruit in the refrigerator! That explains a lot…..I will give this another chance as I love have Spring flowers during the winter. Thank you! Thanks for the nudge to get back to forcing spring bulbs. I had done that with my children when I was a young mom. It is a great project from toddler on – I haven’t done any recently – life sometimes gets in the way of fun things. I still have daffodils to plant so I will plant some in pots. I planted 200 daffodils yesterday and 50 alliums among my hosta bed. Spring will be beautiful!! 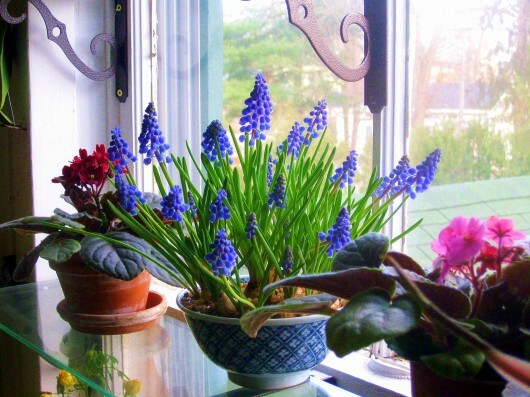 I might just go searching for some Muscari at the nursery today – they look so beautiful in your window. As always, we can count on you for timely information. Alas, anything related to gardening is problematic in Texas, and what you can get away with in North Texas is impossible in East Texas or the Hill Country. Bulbs are no different, as our winters are unpredictable, especially for day-time temps. I have had crocus, anemones, Dutch iris and even tulips (which proves my nut-case status) in my fridge for a month – with plans to plant in January and a vision of lovely blooms all the heck over the place come spring. Your experience with refrigerating bulbs gives me pause, so thank you for saving me from probable disappointment. My options now are to 1) pot and buy a small refrigerator 2) pot and put them in my garage with the hope that fluctuating winter temps will be sufficient to chill. I will take advice to heart, consult the all-knowing ladies of the renowned Hunt Garden Club, and let you know in a few months how I fared. LOVE you and your website. Read all your postings and love both recipes and gardening tips. Just read your article on forcing hard bulbs. I, of course, do not have an extra fridge. How cold can these bulbs be if placed in a garage? I live in the Northwest Territories in Canada and we are already close to minus weather. My garage does stay warmer than outside but by December it could be in the minus range. 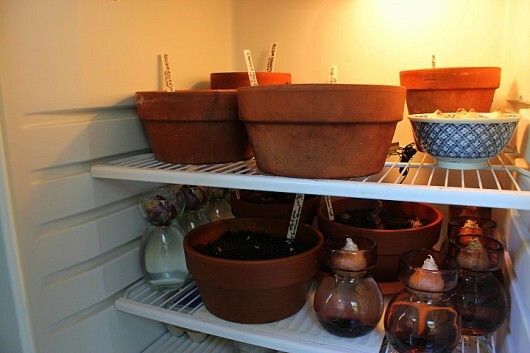 Hi Susan M – You are right — to keep the bulbs dark in your 2-windowed shed, just place a box over the pots. Hi Pat – Under ideal conditions, bulbs want temperatures cold but above freezing — 35-45°F, or 1-7°C. If your garage is attached to your house, put the pots near the house wall. And be sure to pot your hardy bulbs right away, so they have time to make roots. Rooted bulbs can survive freezing temps. Could I just plant them in pots now and leave them outside covered with something dark (pile of leaves? and then bring them in in December? I live in zone 8 in eugene oregon. 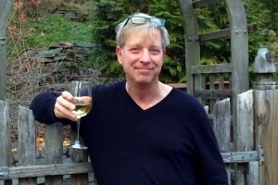 Hi Kevin – I love your blog and get your newsletter delivered via email. You always have such great ideas, lovely photos and I love your sense of humor. I just picked my amaryllis and paperwhites for the holidays. I was wanting to buy miscari as well as other gorgeous bulbs to cheer me through the Maine winter but like, you didn’t have great luck initially with refrigerated bulbs. I am excited to try this method which I hope my basement bulkhead will work as it is cold and dark. I just converted the window seat in my living room into a sofa table for the winter, which would be the perfect place to view blooms come January. I have one question… do you continue to water weekly or when dry until you bring them out of their cold storage? thanks! Hi Tami – Although the method you describe would not work here in New York’s Hudson Valley (the pots would be frozen to the ground at forcing-time), it might just work for you. Keep in mind that larger bulbs (daffodils, tulips, hyacinths) need 12 weeks of cold. Smaller bulbs (snowdrops, muscari, crocus) can be forced after 10 weeks of chilling. kribbons – Bulbs hate to have their roots meddled with, so transplanting is not a good idea. But you could certainly dig a hole, and then plant the whole pot of muscari. 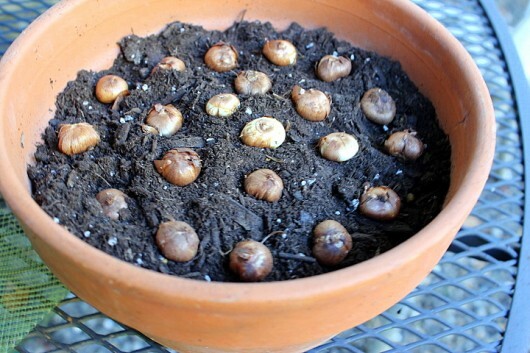 After the bulbs go dormant (the foliage will wither), you can safely remove the pot, and re-plant the individual bulbs. Hi Denise – After the chilled bulbs are brought to sunlight and warmth, they will grow like mad. At this time, you should water the pots freely. You should fertilize freely, too, but only if you intend to save the bulbs for future planting outdoors. Have fun with your project! Have you ever tried forcing Pink Buttercups (oxalis adenophylla)? I bought a package for my mom, but took out a few to try and wondered what your thoughts might be. Great site by the way… I’m so glad I stumbled across it looking for information on winter sowing. Thanks! Hi Chris – I haven’t tried it yet, but I should think oxalis adenophylla would force perfectly well. I’d give it the same care as the other hardy bulbs listed above. Have fun! Once the forced hyancihs blooms have dried up what DO I DO WITH THE BULBS.. THEY ARE STILL SITTING IN THE Forcing vases with water covering their roots. 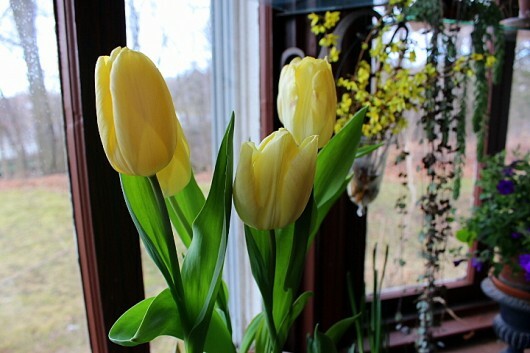 Hi Kathy – Be sure to read this post: Forced Bulbs: What To Keep, What To Toss. Hi Kevin–I love your site! I stumbled across it when I was given 40 lbs of beets (a couple of weeks ago), and didn’t know the best way to freeze them! Love your gardening tips…Now am going to have to force some bulbs—used to do it years ago, then life got busy..
Hi Kevin. I love all your tips, but this one is the best! 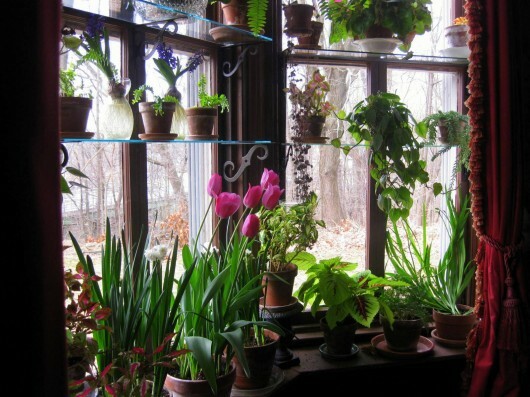 Forcing bulbs is going to be fun as I just bought a new home with the perfect sunroom! I will definitely make winter much more fun! Thanks for all your helpful hints and recipes. You’re the best!! Thanks Kevin. Will try this method for sure. Love your African violets! 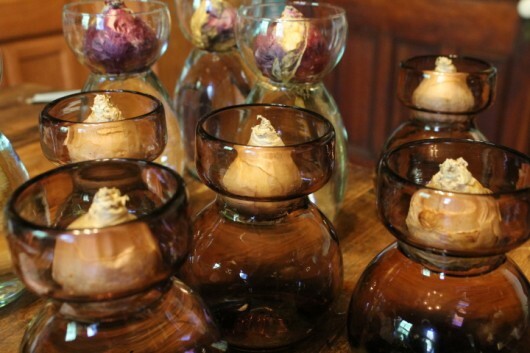 I have tried forcing hyacinths twice, hunted down some special glass vases too. I purchased pre chilled bulbs and what happened -nothing. I might try again , I have all those vases ( 6). Any advice for Camarillo,just south of Santa Barbara? Could I bury tulips outside in pots for 12 weeks and bring them in to force them? Hi Mary V – Un-potted, “pre-chilled” bulbs don’t always perform. 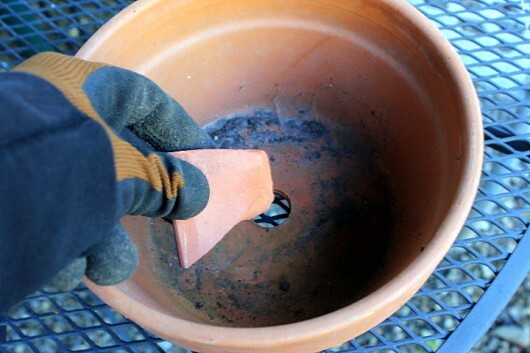 Use my pot-and-chill method — it really works! Hi Brian – If Santa Barbara (miraculously) receives 12 consecutive weeks of 35-40°F temperatures, then yes — your outdoor idea will absolutely work! Okay so I just got back from the garden store and I got tulip and Delft blue mixture hyacinths. You put your hyacinths in a vase right from the ‘git go’? Do you put them in water and keep them watered in the fridge? How should I do the tulips? Because of your blog I have gained weight and lost $$$! All good things right?! Thanks for the tour of your beautiful home. I love older homes as they have so much character. Absolutely love the antique kerosene lamp and the ceiling light fixture is gorgeous. I am going try my hand at forcing some bulbs. I love the early spring bulbs especially in the dead of winter. There is just something so uplifting to see those beautiful colours when the ground is covered in snow and ice. I haven’t had luck doing this because I forget to water them in the cold garage. Give me an idea of How long to go after the initial watering before I rewater and I’ll mark it on the calendar. I love your Newsletter and your You Tube Channel! I tried this last year and failed. After reading the newsletter i understand what i did wrong! Thanks! wait….did i mention that i love you too! Kevin, I was just wishing aloud that I could find a quick definitive tutorial on forcing bulbs – mine always bloomed about the time the others outside showed up. Yes, we really need them a lot earlier. Thank you for answering my silent call!! 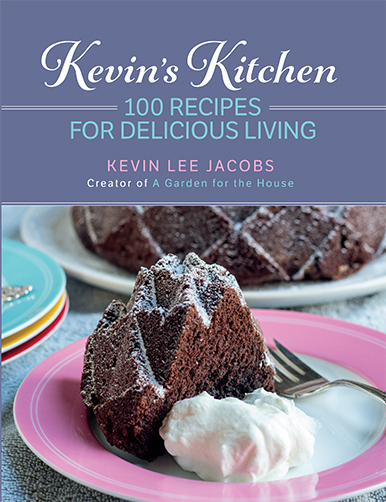 This is just the inspiration needed for gift-giving to family & friends during the Holidays. Everyone here in Michigan will love the sensory respite from our winter wonderland. Thanks! I live in Florida can I force bulbs as well? I have a spare fridge but we don’t get that cool of temperatures here. Ant thoughts? Hi Debbie – Yes, where you live, a refrigerator is the answer! Last year I tried to force bulbs as you showed(tulips, muscari, hyacinths), planting inOctober, watering once, keeping them in a small refridgerator until February. When I brought them out to reap the rewards, none emerged. I finally checked to see what had happened and all had molded in the pot. Any idea how to prevent that? I admit I may be too discouraged to try again. Kevin ….. Just another inspiration you give all of us! Makes you look forward to those flowers in Winter. You need to get on a regular TV spot so people can see you all the time. Thank you! Mr. Fox is lucky! I bet you’re both lucky! Thanks so much, Kevin, for all your great information and inspiration! Am going to try this with some of the bulbs we dug up (just yesterday) from our old place . I think the upstairs loft (been here only a month) should only get around 65 during the winter.